Ring Sizing "Hacks" to Get the Perfect Fit! Ring Sizing “Hacks” to Get the Perfect Fit! There are so many factors when searching for an engagement or wedding ring: selecting the diamond, finding a ring that matches his or her style, and of course, staying withing budget. It can be easy to forget about selecting the right ring size, which means you’ll have to figure out how to make a ring smaller or larger after the purchase. Buying a ring that doesn’t fit is a common mistake, but it’s important to fix this problem as soon as possible. If the ring is too large, it might come off and get lost, or it will slip sideways and look awkward on the finger. If a ring is too small, it can be uncomfortable and cut off circulation—if you manage to get it on at all! Fortunately, there are a few ways to make a ring smaller so it fits perfectly on any finger! Before you resize the ring, make sure it actually doesn’t fit. The general rule of thumb is that a ring that fits well is one that goes on the finger easily, but comes off with a bit of difficulty. Wearing the ring should not cause any discomfort, and the ring should sit snug on the finger without spinning. If a ring is too big, the first way to make it smaller is to have it resized by a professional. 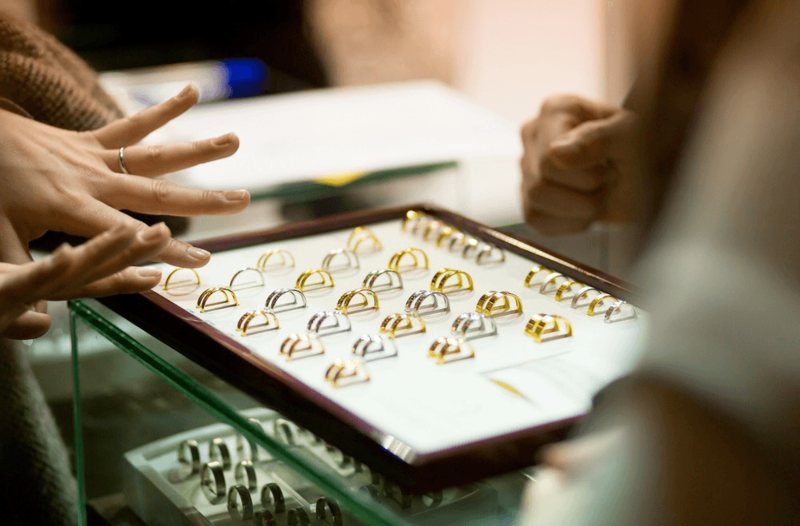 Most jewelry stores offer ring resizing services, so take the ring to any reliable jeweler that is located near you. Typically, professionals can alter rings by a maximum of two sizes, which means they can make the ring two sizes larger or two sizes smaller. Making a ring smaller is easier than making it larger—the process of downsizing is actually pretty simple. All the jeweler has to do is cut a chunk of the band and weld it back together. Voila! A smaller ring. Whenever a ring is professionally resized, it should be perfectly polished and look just as pristine as it did before the jeweler altered it. This is the simplest way to resize rings since it’s handled by a professional who will know exactly how to make the ring smaller. There are some cases in which resizing the ring is not really an option. For instance, if the ring is a family heirloom that has not been modified for generations or if the ring has a special engraving on the band, resizing is risky or even impossible. 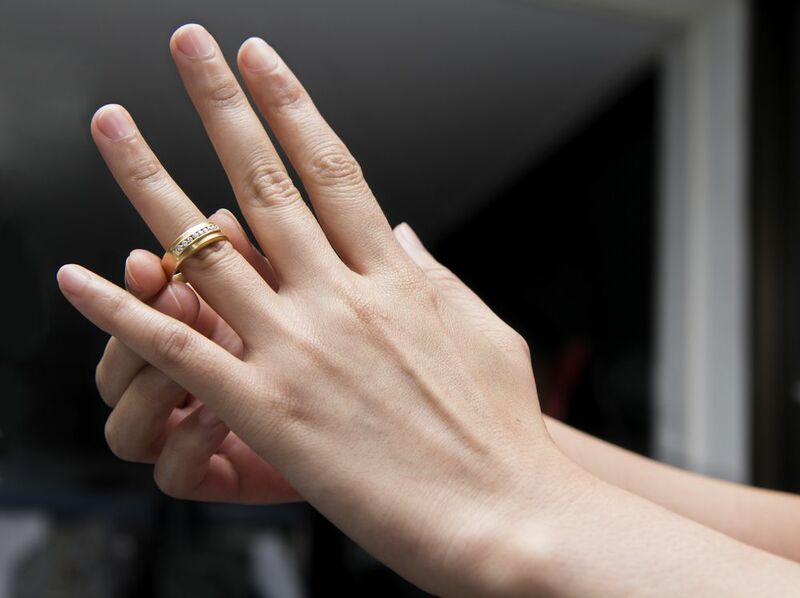 Even if your ring can be resized, you may want to consider other options first. Why? It is no fun whatsoever for your fiancé to be forced to give a ring back for a few weeks to get it resized. Your fiancé will want to show her ring off to her friends and family, so it may be hard for her to part ways with her precious engagement ring immediately after your proposal. Sizing Beads – A jeweler can easily solder on two metal beads on the bottom of the ring. They serve as a wedge between the ring band and the finger and help to prevent the ring from spinning to the side. Fold-Over Device – A fold-over device is essentially a small metal bar soldered to the bottom of the ring to make it fit properly. It is also an easy fix for jewelers and it may be more comfortable than sizing beads. Ring Snuggie – You can find these online or at many retail stores. They are basically little pieces of silicon that you wedge between your finger and the ring to make it fit. The ring snuggies do work, however, many complain that they lift the ring awkwardly off the finger, which doesn’t look as nice. 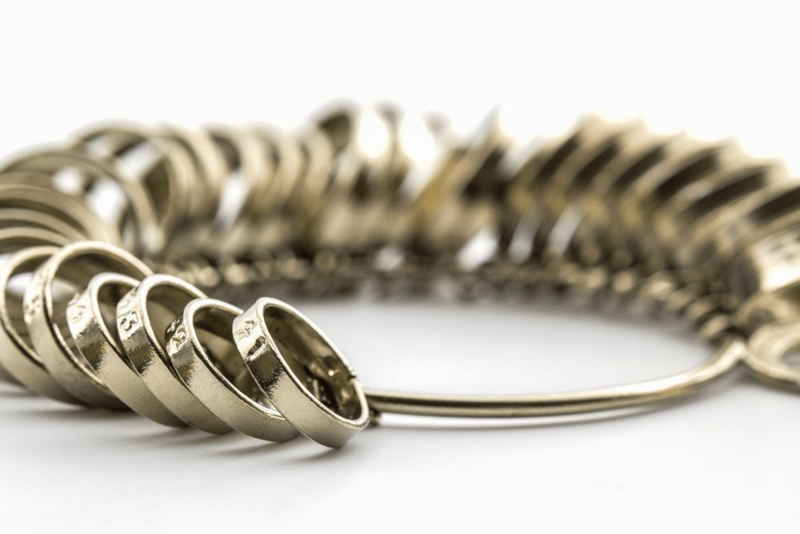 Spring Insert – A spring insert is usually made of white gold and bears a horseshoe shape. It is installed into the inside of the ring band and serves the purpose of keeping the ring tight and snug. It is comfortable and affordable, and most people prefer them over sizing beads. Food Grade Silicone – Buy food grade silicone and make your very own homemade perfect fit. This requires a little bit more craftsmanship than the other options, but it yields great looking and effective results. Basically, you put the desired amount of silicone on the ring to make it fit your finger size. This looks better than the ring snuggies and can be easily peeled off from the ring. These are great alternatives to consider when having the ring professionally resized is not an option, or if you don’t want to permanently resize the ring. For example, if you use a spring insert to resize the ring, you can simply remove it to restore the ring’s original size. This means you can expand the size of the ring in the future if your hands swell due to pregnancy, arthritis, or other health conditions. Have questions? Call 866-737-0754 to speak with a jewelry expert for guidance. If you don’t want to worry about figuring out how to make a ring smaller or bigger, it’s best to take the time to gauge your significant other’s ring size prior to purchasing a ring. Unfortunately, there’s no exact science to sizing a ring properly. It is unlikely you can tell someone’s ring size by just looking at his or her hand. The only sure fire way to get the size right is to do some digging, to go under the radar and find out their ring size. Ask a friends. They can help you guess the size, or ask THEM what size they wear, and deliver the information to you! Borrow another ring they regularly wear and ask a jeweler to tell you its size. Be sure to take note of which hand and finger they wears it on. If you’re worried about them missing the borrowed ring, take 5 minutes to trace the inside and outside loop of the ring on a piece of paper. For a rough ballpark, you can also compare fingers when holding hands! Is their ring finger larger or smaller than your pinky? Hopefully, you’ll be able to do some digging and find out exactly what her ring size is, but if something goes awry just know that there are other options out there. There are many affordable, effective ways to make a ring fit, so don’t panic if the ring doesn’t fit perfectly on her finger when you pop the question!